Environmental Impact Assessment (EIA) is a significant, anticipatory, environmental management tool. International debate focuses on its enhancement to meet the challenges of sustainable development as well as demands for scientifically robust integrated and participative decision-making. This handbook hopes to improve practices by contributing an international, multidisciplinary, ready-reference source to this debate. Volume I addresses EIA principles, process and methods. Part 1 maps the EIA process and its impact on decision. It positions EIA in the context of sustainable development and relative to other decision tools, including economic valuation. It also positions strategic environmental assessment (SEA) in a similar way. Part 2 addresses the elements of the EIA process and significant impact assessment topics (air, water, ecological, social, risk, landscape and visual) not only in terms of good practice but also methodological evolution. 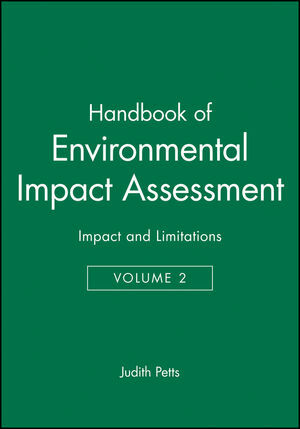 This volume concludes by addressing cumulative impact assessment and SEA methods. 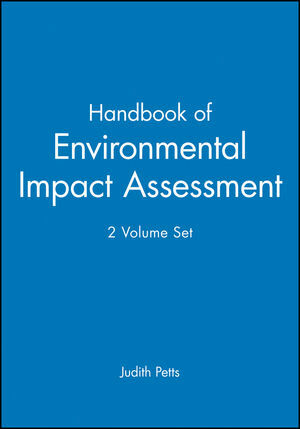 Volume II provides a unique consideration for EIA implementation and practice in Europe, Africa, the Far East, South America and North America. It uses a number of project types to provide 'how to do' guidance and addresses practice in policy and plan assessment. This book should be read by legislators, decision-makers, economists, developers, industrial managers and consultants involved in this significant field. Part 1: Quality and Effectiveness. 2 Comparative Evaluation of EIA Systems. 4 Quality and Quality Control in EIA. Part 2: EIA At the International Level. 5 The Convention of Environmental Impact Assessment in a Transboundary Context. 6 Environmental Impact Assessment A and Multi-Lateral Financial Institutions. 7 Environmental Impact Assessment in Central and Eastern Europe. 8 Environmental Impact Assessment in East Asia. 9 Environmental Impact Assessment in Africa. 10 Environmental Impact Assessment in South and Central America. 11 Environmental Impact Assessment in North America. 12 Environmental Impact Assessment in the European Union. 14 Environmental Impact Assessment of Land-Use Plans: Experience under the National Environmental Policy Act and the California Environmental Quality Act. 15 Environmental Impact Assessment and Waste Management. 16 Environmental Impact Assessment of Road and Rail Infrastructure. 17 Environmental Impact Assessment for Energy Projects. 18 Environmental Impact Assessment for Mining Projects. 19 Environmental Impact Assessment for Water Projects.